George Mikhailovich Benigsen was born during the First World War in the city of Kazan to the family of a military engineer of the Russian Imperial Army as the youngest of four children. He was baptized on the day of the Holy Trinity by an Orthodox priest of a Tatar background, which seems to have foretold the future missionary and international character of his priesthood. The days of his very early childhood were lit by the fire of the city of Kazan, when the White Army was retreating and Kazan fell under the power of the advancing Bolsheviks. Engineer Mikhail Ivanovich Benigisen and his family were among those who fled toward Siberia, hoping to join the White Army there. The retreat was long and difficult. It reflected the apocalyptic words of the New Testament: "Pray that your flight may not be in winter." A similar retreat found a very colorful description in the novel of Boris Pasternak, Doctor Zhivago. The effort to join the White Army in Siberia failed, and instead the Benigsen family found itself in the hands of the Red Army. God was merciful and led the family through fire, freezing weather, arrests, famine, typhus, and the disorder caused by the Red bands. On all these wanderings the family was accompanied by a small and modest icon of St. Nicholas the Wonderworker, the only treasure that the family was able to carry through all its tribulations and which remains in the family today. In 1921 the Benigsen family was able to move to the city of Smolensk, and in 1924 to immigrate to Latvia, which at that time was one of the three independent Baltic states, and where grandparents lived. Though the country still bore the wounds of war and revolution, it seemed to the Benigsen family utter paradise. At that time the future Fr. George was nine years of age. The family settled in the city of Dvinsk, now Daugavpils, in which his childhood and youth passed. There he received his primary and intermediate education, and there his spiritual life found its roots. The family was traditionally religious. All feasts and fasts were observed, the Divine Services were attended, and life proceeded according to the Church calendar. In the schools of Latvia religion was freely taught. In the middle years of high school, a certain spiritual crisis occurred. The faith of childhood, which was instilled by the family and the Church, started gradually to fade and to be replaced by a youthful skepticism. Church life limited itself to sporadic attendance at services and to some effort to observe annual Confession and Communion in order not to sadden one's relatives. This was joined by a feeling of vague sadness, dissatisfaction, and disappointment. In 1933 the oldest son of the Benigsen family died at a young age. This death without doubt had a great impact on the soul of the younger brother. Fr. George clearly remembers the evening of Easter Sunday of 1933. Although that year he attended some of the services of Holy Week and Easter Matins, in spiritual perspective all this had no effect on him. On that evening of the first day of Pascha, he passed by the parish church, from which bell tower bells were joyfully ringing. For some reason he decided to enter the church, now almost empty, where Paschal Vespers were being celebrated. There was nothing especially solemn or impressive in that particular service. Nevertheless, it was here that all his future life was decided. In a way that was mysterious, during that vespers in the nearly deserted church, he suddenly felt, understood, that exactly here the solution to all his problems could be found, as well as the answer to all his questions. All vague plans for a future career ­ to become an artist, a lawyer, or an architect - fell away. One thing became clear: to become a priest. In this only was the whole meaning of his existence, his life, of creativity. Precisely in this was the justification for everything. Strange as it may sound, he left the church that evening with a very firm decision that has never changed, with a plan for the life that lay before him. The new way of life, in which active church life was prominent, led the future Fr. George to an encounter with an organization which was destined to become not only a stimulating human environment, but a school of theology and a school of practical Christianity. This organization was the Russian Christian Student Movement, which in those years experienced a special spiritual and organizational development in Europe. This organization was a true fellowship of idealistically inclined people, who found in the personal and eucharistic community strength for the religious formation of their life. Among the spiritual and intellectual leaders of the Movement was the very bloom of contemporary and theological thought. The Movement gave to the Church a large number of young and talented priests and brought up generations of believers and church-oriented laity. The year 1937 was an especially important landmark in the life of Fr. George. In this year he had to accomplish what in the lives of other people is often spread out over a much longer period of time. In 1937, at the age of 22, he married Elena Ivanovna Kraubler, a fellow member of the Russian Christian Student Movement in Estonia. In the fall of the same year he enrolled as a student in the theological faculty of the state university of Riga, and on the 14th of September of the same year in the Cathedral of Riga Metropolitan Augustine (Peterson, d. 1955) of Riga and Latvia ordained him a Deacon with an appointment to the same Cathedral. His diaconal service was combined with his studies at the university and teaching religion in several primary schools in the city of Riga. In June of 1940 the relative short span of freedom in the Baltic states came to an end. This fragile freedom was crushed by the treads of Soviet tanks that invaded Latvia, Estonia and Lithuania. The Soviet system brought with it frightening terror. The number of parishioners and friends gradually faded, the noose of general fear became tighter and tighter. The threat of militant atheism hung over the Church. Teaching religion in the schools was cancelled. The theological faculty of the university was closed down. The future was becoming more and more tragic, but quite clear: arrest, prison, execution, or exile to a concentration camp. In these circumstances a definite decision was ripening in Fr. George's mind. The wonderful four years of the diaconate -- this "spring of the priesthood" -- were unfortunately at an end. If it would be necessary to go either to a jail or to Siberia or to Karaganda, it seemed much better to go down this road with not just a knapsack on one's back, but with the fullness of the gifts of the Divine Grace, as a priest. Thus on the day of Pentecost, on the feast of the Holy Trinity in the Holy Trinity Cathedral of the convent of Riga Fr. George Benigsen was ordained a priest. The ordination was performed by the Exarch of the Baltic states, Metropolitan Sergius (Voskresensky), later, on April 28, 1944, assassinated by the Soviet partisans. Under his episcopacy Fr. George combined his diaconate and later priestly service with the duties of the secretary of the Baltic Exarchate of the Patriarchate of Moscow. Metropolitan Sergius was an outstanding bishop, a courageous servant of the Church, a talented and daring administrator and an inspired and inspiring teacher. In June of 1941 Riga heard the terrible thunder of war, and on the 1st day of July the first detachments of the German army entered the city. The noose of the Soviet terror did not have enough time to finish its task. The city that lived through the Red terror met its new "liberators" with open arms. As is well known, this joy was not to last long. A new dictatorship quite quickly replaced the so-called "liberation". In the early fall of 1941 Metropolitan Sergius was able to get permission from the German military government to send a group of priests as missionaries to the northwestern regions of Russia occupied by the Germans. The ancient city of Pskov became the center of the Orthodox mission. Russian emigres who lived in western Europe followed the developments in their native land and knew that the faith was not dead in Russia, in spite of the very cruel system of universal anti-religious indoctrination. The reality that the missionaries met in Russia exceeded all their expectations. The work of the mission was the first experience of church work in Russia minus communism. This work was undertaken and pursued in the harsh and difficult conditions of the German occupation, nevertheless in conditions of freedom, however relative and meager, of the Church and the Faith. Together with other priests and missionaries, Fr. George became a witness of spontaneous religious revival, of the revival of Church life, of the great thirst for the Faith in the population. The labor and the work of the mission of Pskov continued for two and one-half years. While serving as a priest in Russia under German occupation, Fr. George served in the ancient cathedral of the Holy Trinity Cathedral of Pskov and was the secretary of the mission. Then he became rector of the church of the Holy Martyr Demetrius, where he organized a daily church school for 200 students and an orphanage for forty children who had lost their parents in the war. The year 1944 was the year of new retreats, of renewed flight from the advancing communists. A short respite in Latvia, participation in the funeral of Metropolitan Sergius, assassinated by communist terrorists, -- and fleeing again with the family to the most terrifying place in 1944: into a Germany that was rapidly losing the war. The war, the bombings, the overfilled trains, the poor conditions in the refugee camps, arrogant Nazism, Berlin shaking from the bombings of the last year of the war, brief service in the Berlin Cathedral under the gracious Metropolitan Seraphim (Lade), spiritual care of the Russian refugees and workers brought from Russia to forced labor in Germany. Fleeing from Berlin with a group of clergy and laity to the south of Germany in February 1945, the war's end saw the Benigsen family in a small Swabian village where they became witnesses of the last street fighting between the conquered Germans and the conquering Americans. It was the end of the war ­ but also the beginning of compulsory repatriations, under conditions of almost complete ignorance by the Allies of the political situation in the Soviet Union and in liberated Europe. At that time refugees from Eastern Europe had been given a new name: "DP" -- "Displaced Persons." Here begins a new era of Church life and Church existence. In the ruins of semi-destroyed German cities, in Munich, Hamburg, Stuttgart, Frankfurt, modest new churches arose. Similar churches were created in the larger refugee camps. The banners of conquered Nazism were made into vestments, American tin cans became the first church banners, empty artillery shells were made into chalices and church bells. The Church became again a unique place of comfort, defense, and peace for the millions who had lost their homeland, homes, loved ones, and who, instead of being citizens of this or another country, had become "displaced persons." The new period of pastoral service of Fr. George began in a small German village where his family, together with a group of clergy and lay people from Berlin, finally saw the war's end. By sheer miracle (the American commandant's secretary turned out to be a schoolmate of Fr. George) they escaped from compulsory repatriation to the Soviet Union. The political understanding of the conquerors gradually dawned, the first American friends appeared on the scene. Then the years of service in the refugee camps began, first in the British zone of occupation near the city of Hanover. The danger of forced repatriation gradually faded, and social and cultural life revived and became more organized, newspapers and magazines, and books were published. All this took place with the active participation of the Church and the clergy. Departures for other countries beyond the ocean then began. The pastoral service of Fr. George for the refugee camps ended in 1947, with his appointment to St. Seraphim Church at the Home of Mercy in the city of Munich. The Home of Mercy was founded by Fr. Alexander Kiselev, in the former home, now semi-destroyed in the bombings, of Hitler youth. On the fourth floor of this house by some miracle an icon was found, a small icon of St. Seraphim of Sarov, in whose name the chapel was consecrated. Besides the chapel, the Home of the Good Samaritan accommodated a full Russian high school (gymnasium), a school of nursing, a clinic, a dental institute, a printing shop and editorial office, a dormitory and a public dining hall. Fr. Alexander Kiselev immigrated to America in 1948. After his departure, Fr. 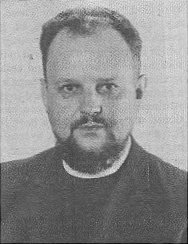 George became the director of the Home of Mercy, combining his pastoral, administrative and educational duties for the Home of Mercy with editorial work for the reborn Messenger of the Russian Students Christian Movement, with the duties of religious consultant for the headquarters of the YMCA in the American zone of occupation. On November 10, 1950, on a plane of the IRO (International Refugee Organization) the Benigsen family landed in La Guardia airport in New York. At the end of January of 1951, Bishop John (Shahovskoy) of San Francisco appointed Fr. George to his first American parish, as the rector of the Church of St. John the Baptist of Berkeley, California. At this church Fr. George was to spend only one incomplete year. On December 9,1951, Bishop John appointed him Dean of Holy Trinity Cathedral in San Francisco, where Fr. George served more than nine years, combining his pastoral work in the Cathedral with the duties of Secretary of the Diocese of San Francisco and the West. During these years Fr. George founded a church school at the Cathedral, at which by the time of his departure from San Francisco 130 students were enrolled. Fr. George actively participated in the pan-Orthodox, the ecumenical, and the social life of the city, which was acknowledged in the presentation to him of the "key to the city" by the mayor of San Francisco at the time of his departure. In February 1960, by his own petition, Fr. George was transferred as Rector to the parish of the Transfiguration in Denver, Colorado, and was appointed Dean of the Colorado Deanery. His transfer to Denver was defined by the necessity to offer help to the Denver parish, which found itself in deep crisis. Fr. George's mother died in Denver, and was buried at the Orthodox cemetery there. Fr. George found love and complete support in all his pastoral endeavors from his new parishioners. As in San Francisco, he organized a church school and took active part in the pan-Orthodox and the ecumenical life of the city. Matushka Helen organized a church choir, which sang in English and Church Slavonic in the church as well as at pan-Orthodox services, including services in the well-known chapel of the Air Force Academy at Colorado Springs. Fr. George was invited to teach Russian at the University of Colorado. He used this opportunity to enroll in graduate school at the University and in 1962 received a Master's degree in Russian studies. From that time through 1978, Fr. George combined his pastoral service with academic work. Fr. George's son Nicholas also graduated from the University of Colorado. Both his pastoral and academic experience in Colorado gave Fr. George a closer acquaintance with American life and the chance to join in the American social milieu. In the summer of 1964, Fr. George and Matushka were in Europe, where Fr. George was in charge of a special program for students of Russian in Finland, organized by the Universities of Colorado and Kansas for especially select students. The Benigsens were able to visit several European countries and to observe Orthodox Church life in Europe. In September 1964, Fr. George was invited to a new post, Orthodox chaplain for the students of the University of California in Berkeley. There he created an Orthodox student center along with a chapel of St. Joseph of Arimathea. The next year the field of Fr. George's activities widened. He was invited to organize the Russian program at the newly opened campus of the University of California at Santa Cruz. While occupied by the development of this program, he continued to keep regular services in the chapel of the student center In Berkeley, and after a short time opened a second university Orthodox chapel in Santa Cruz dedicated to Christ's Resurrection. The service in these two chapels and teaching at the university, where Fr. George also created a summer institute for intensive study of foreign languages, was interrupted In 1967 when Metropolitan Ireney (Bekish, d. 1981) invited Fr. George to New York with an appointment as Dean of the Holy Protection Cathedral and Secretary of the North American Metropolia. Fr. George's service in New York was short. In the fall of 1968 he received an appointment as Dean of Ss. Peter and Paul Cathedral in the city of Montreal, Canada, and as Secretary of the Canadian Diocese. Fr. George's wife took upon herself the duties of director of the cathedral choir, and organized a children's church choir from the students of the church school. Fr. George and Matushka actively participated in the teaching at the church school and in 1969 lead the summer camp for Orthodox children of Montreal and environs. In the summer of 1970 Fr. George was appointed rector of St. Nicholas church in Saratoga, California, where Matushka took upon herself the duties of choir director. Fr. George returned to his work as director of the Summer Language Institute at the University of California at Santa Cruz, combining his pastoral labors with his academic and administrative activities. Besides that, for several years he was Chancellor of the Diocese of San Francisco and the West, which was under Archbishop John (Shahovskoy, d. 1989). In 1978 Fr. George ended his university activities. Fr. George's rectorship in the city of Saratoga continued for ten years. 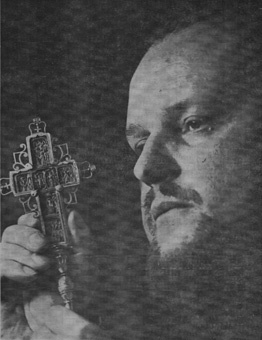 In the beginning of 1980, under Bishop Basil (Rodzianko), he returned to the duties of Dean of Holy Trinity Cathedral in San Francisco and continued to work as Chancellor of the Diocese. On July 1, 1981, he retired, and continued his pastoral duties on a voluntary basis at the Holy Assumption Monastery in the city of Calistoga, California. From 1983 to 1991 at the invitation of Radio Liberty, Fr. George produced a weekly religious broadcast to Russia. Some of his radio-talks were collected and published in 1997 in Moscow under the title, Not By Bread Alone (The Brotherhood of St. Tikhon). Archpriest George Benigsen actively participated in the national life of the Orthodox Church, her All-American Councils (Sobors), and was a member of the Metropolitan Council. He received all ecclesiastical awards including the mitre. For the fiftieth anniversary of his priestly ordination he was awarded a grammota by the Holy Synod of Bishops of the Orthodox Church in America. Archpriest George Benigsen fell asleep in the Lord on August 6, 1993, on the day when the Autocephalous Orthodox Church in America celebrates the great feast of the Lord's Transfiguration. The funeral liturgy for the beloved and much esteemed pastor and teacher took place at Holy Trinity Cathedral in San Francisco. The Primate of the Orthodox Church in America, Metropolitan Theodosius, presided over the services, attended by a multitude of clergy and faithful from all parts of America and Canada. The grave of Father George Benigsen is at the Serbian cemetery of San Francisco. Back to index of authors on the Holy Trinity Cathedral home page.